Baco, Oriental Mindoro – Shell Philippines Exploration B.V. (SPEX), Shell Shared Services Centre-Manila (SSSC Manila), and Pilipinas Shell Petroleum Corporation (PSPC) volunteers participated in a classroom repair and refurbishing project in Barangay Mayagao as part of the nationwide 2009 Brigada Eskwela. Close to 50 volunteers joined local officials and residents to clean up and mend the classrooms of the Baco National High School (BNHS)-Pulang Tubig Annex to prepare the facility for the start of classes last June 1. Barangay Mayagao is one of the four coastal barangays of Baco. Brigada Eskwela volunteers painted the interior and exterior of the classrooms, including the roofs. Local ironsmiths also volunteered their services, creating 100 armchairs. Volunteers also paved the shallow area of the school using materials donated by the joint venture partners. Dante Castillo, teacher-in-charge of BNHS, said the Brigada Eskwela project has helped ease the financial burden of the school and parents. He thanked all the volunteers and the leaders of the Parents-Teachers Community Association (PTCA) for their participation in the momentous activity that they considered as an answer to their prayers. Malampaya provided all the materials needed for the project such as paint, iron, shovels, rakes and other equipment. According to the principal, the Brigada Eskwela project will benefit not only the students in Barangay Mayagao but also other students from nearby barangays who study at BNHS. Barangay Captain Armando Delgado was grateful for Malampaya’s assistance and encouraged his community to continue these efforts in partnership with the private sector. Cecilia Zulueta, municipal planning and development officer, expressed both surprise and gratitude that an obscure and remote fishing village such as Pulang Tubig was awarded with such a project by Malampaya. “We will not forget this gesture by Malampaya. 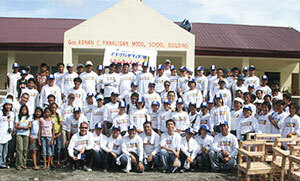 They truly are willing to help,” Zulueta said to the volunteers from Manila on the day they arrived at Barangay Mayagao. Rufino Asi, who donated the lot where the school stands, said the community made the right decision to set up a high school. He shared that during his time, he was the only one from Mayagao who finished high school. But he had to cross three rivers and walk far to reach the nearest school in Calapan, Oriental Mindoro. He now feels encouraged that many have come to give financial assistance and contribute their time and effort in improving the school. “I hope that many more people like you will help us,” Asi expressed. Others, such as the mayor of Baco, Hon. Graciano de la Chica, and President of the PTCA Imelda Catoy, extended their thanks to the volunteers. Shell Sustainable Development Manager Chito Maniago and Malampaya Foundation, Inc. Executive Director Luke Esteban, also thanked the volunteers for their contributions. Other members of the Communications Team like SPEX and Exploration and Production Asia-Pacific Communications Advisor Christine Del Valle, Pilipinas Shell Sustainable Development Assistant Clara Antonette Eser, and staff from the Agatep Advertising Agency also graced the Brigada Eskwela activity.